Started in 1983, G-SHOCK is turning 30 in 2013. To celebrate the special milestone in the brand history, Casio is organizing a year long celebration that give every G-Shock fan all the reasons to cheer. Following past traditions, Casio picks the most popular G-Shock models, redesigned those models to incorporate the signature of each anniversary theme and commissions an accomplished name in its field to design the anniversary trademark. For their 30th anniversary, they choose Eric Haze, one of the world’s most acclaimed graffiti artist based in New York City. This is not the first time Eric has been commissioned by Casio. Their collaboration started 15 years ago and have been working together for countless number of projects. Eric Haze was also the artist who was commissioned by Casio to work on G-Shock’s 25th anniversary logo. The G-Shock G9330A-4 is one model that is part of Casio’s line-up for G-Shock’s 30th Anniversary. The G-Shock G9330A-4 limited edition model is a customized edition of the well-received G-Shock G9300-1 model. By the serial numbers alone, you can tell that both G-Shock G9330A-4 and G9300-1 are built using the same 9300 casing. Since it is to mark the 30th anniversary of G-Shock, hence the model 9330. Behind this number, there is an additional letter ‘A’ which according to our G-Shock decipher guide (See: Simple Ways to Decrypt G-Shock Serial Number), is used to indicate the special design in the face dial of the watch. 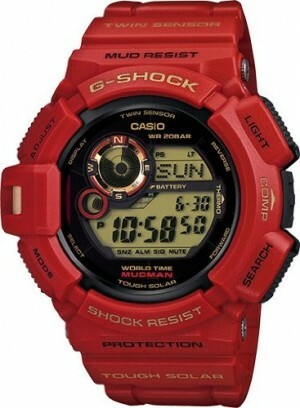 The last digit, ‘4’ indicates that the G-Shock G9330A-4 is red in color. Other than these 2 design improvements, all else about G-Shock G9330A-4 and G9300-1 are identical. One of G-Shock’s most popular watches is the G9300-1 model and this MUDMAN line of watch is just one that has been selected to commemorate the 30th anniversary limited edition line-up. The specially revamped model derived from this popular style is the G-Shock G9330A-4. As expected, the limited edition model retains all the features that make the G9300-1, a tough watch that is cool and awesome. In place of the Black resin band with neutral face is the Matte red resin band with gold mirror face. The red and gold color theme distinguish the 30th anniversary collection from all other limited and non-limited edition models. The thing about buying G-Shock’s limited edition watches is that you should see it as an investment rather than liability. Even at the time of this writing, when the year-long celebration has just entered its 2nd month, prices of the 30th anniversary models sold in the market are already higher than the MSRP recommended by Casio. Click here if you want to find out how much sellers in Amazon are putting their price tag on this highly coveted model. Before you go, make sure you check out other popular G-Shock 30th Anniversary models. Two of the more popular series that might also be interest to you are the G-Shock GA110EH-8A and G-Shock GF8230A-4.